Contains very high antioxidant level of 11.85% vs 5-6% for mass-market teas. Character: Slightly piquant with an almost sweet honey-like full green tea flavor. 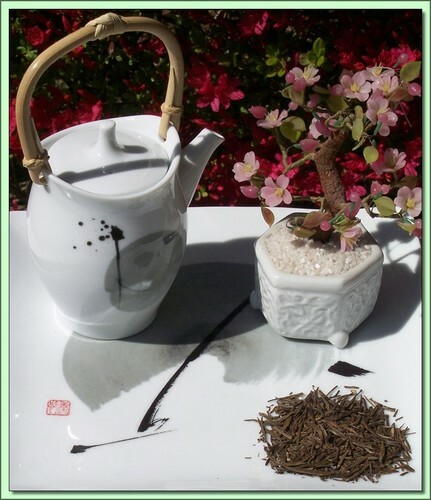 The best Sichuan teas come from the central mountain peak of Mount Meng and this tea is grown on the southern and eastern slopes of this mountain. The heavy mists that surround Mount Meng and volcanic soils provide ideal growing conditions for the special tea. The tea leaves are only plucked during the last 2 weeks of March and must be plucked before the rising sun dries the misty dew on the early morning leaves. The leaves are plucked every day and only new leaves that are less than 20 mm long are used. These leaves are lightly rolled to break the cells every so slightly, immediately steamed to stop any possibility of fermentation and then painstakingly hand formed and pressed before final drying. The result is an early morning fresh green tea with wonderful flavor and extremely pale liquor. Hot Tea: This tea is best enjoyed by pouring 180F/90C water over the leaves (1 teaspoon per cup) for 3 minutes (longer=stronger). Don't remove the leaves. Infuse repeatedly 2-3 times using higher temperatures & shorter infusions until flavor is exhausted.